Want to enjoy a Bloody Mary with your eggs and bacon? Or pair your happy-hour beer with a handful of pretzels? In the words of Sally Struthers – sure, we all do. But if you live in a state with ridiculous rules on the books, you may be prevented from behaving just how nature intended. Here are the eight stupidest statutes that we could dig up. 1. No booze before noon: Early-risers in NYC hoping to enjoy a mimosa or Bloody Mary at Sunday brunch are, to put it bluntly, SOL. A holdover blue law – a regulation meant to limit activities on Sunday (when you should be in church, ahem) – prohibits restaurants and bars from serving drinks until noon on Sundays. Of course, those most in need of a little hair of the dog are those least likely to be anywhere before noon anyway. But morning lushes, you have now been warned; plan accordingly. 2. No buying drinks for female bartenders: Lonely men looking for the hot lady bartenders of their dreams are at a distinct disadvantage in Maryland, where state law makes it illegal to send female barkeeps a cocktail. Note to lovelorn dudes: we are not aware of any law restricting large tips. 3. Beer and pretzels can’t mix: We have some bad news for pretzel lovers in North Dakota. State law prohibits restaurants and bars from serving the popular bar snack and beer at the same time. This might be the reason God invented corn nuts and wasabi peas. 4. Security guards are required: An ordinance proposed by the city council but rejected by the mayor would have required, restaurants in Newark, NJ, that serve 15 or fewer people and want to stay open later than 9 PM to hire armed guards. At least it would have been the safest sandwich experience you’ve ever had (then again, it is Newark, so we suppose it’s better than the patrons arming themselves). 5. You can’t be drunk in a bar: This one seems way too dumb to be true, like airport security frisking babies, or banning raisins in cookies, but true it is. A broad law in Texas makes it legal for cops to go anywhere – including a bar or restaurant – and arrest people for public intoxication. The sad truth about this one is that less-than-ethical officers are using the protection of this law to target minorities they suspect of being undocumented immigrants. Stay classy, Texas. Oh wait, that might be easier said than done. 6. You can’t drink on Election Day: Positively sick about the state of the union? (Tell us about it.) Even sicker to learn your candidate is trailing in the polls on voting day? Well, if you live in South Carolina, don’t expect to drown your sorrows at your favorite bar or restaurant. An archaic law initially meant to prevent slimy political operatives from plying voters with drinks and then escorting them to the polls makes it illegal for restaurants to serve alcohol on Election Day. It’s also illegal for stores to sell alcohol on that day too. It is not, however, illegal for people to stockpile beer, wine and liquor on the day before Election Day. Just sayin’. 7. You can’t take it with you: Many states agree that allowing diners to take home their unfinished bottles of wine rather than overimbibing leads to responsible activities like walking without stumbling and driving home sober. Not so in Mississippi, where re-corking is not allowed. Lame. 8. If you drink, you must eat: Utah has come a long way from the days when bartenders had to be separated from patrons by a partition (so that they wouldn’t be tempted by the mere sight of alcohol) and would-be drinkers could only gain entry to a bar if they had a previously purchased membership. 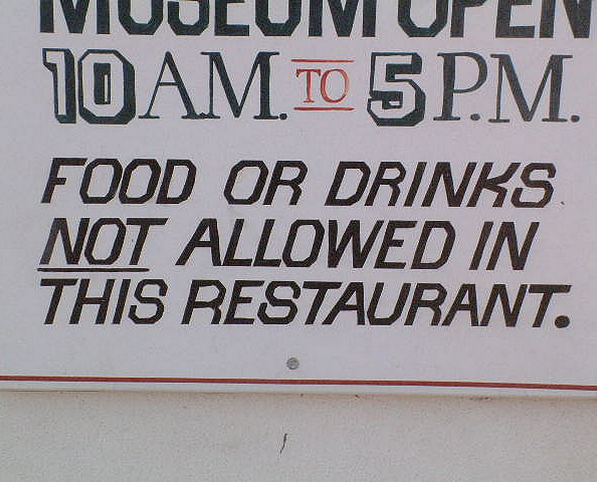 But it’s still illegal to serve restaurant diners a drink if they’re not also ordering food. Also illegal? Drink specials of any kind. The silver lining? Las Vegas is right next door. Honorable mention: In Massachusetts, happy-hour deals are illegal. If frat boys could ever shake those hangovers from their keg parties, they would so organize and protest this.